No need to shudder, here is a great reuse for thrift store shutters. 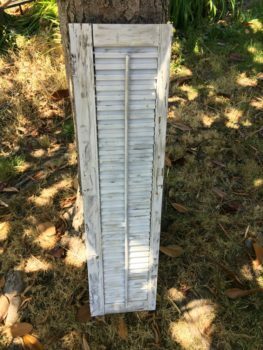 If you frequent thrift stores, the ReStore, yard sales, or even free piles, you are probably going to find some wood shutters. We have several as decor in our home …. When we came upon another one, we couldn’t pass it up. They are usually so inexpensive. We decided to give it a new look by turning it into a shelf. *Affiliate links used to show similar or exact products used. You can read our full disclosure policy here. Picture Hangers –if desired… or drill holes on back so you it can lay flat against the wall and use nails. 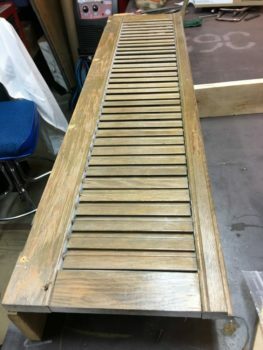 The scrap of wood was cut to fit the length of the shutter. We actually didn’t have one the piece o f wood in the width that we needed so we used two. Paint any pieces as desired. Lightly sand if there is a coating to prevent paint from adhering. On the back of the shutter, add picture hooks to attach to the wall – one on each side to keep it stable. Or you can drill holes so the shelf can lay flat against the wall. The scrap wood, shelf, was attached to the shutter with screws-drilling a pilot hole first with drill bits. The brackets/corbels were screwed into the shutter. To add the hooks, we measured out the distance we wanted the first hook to be at. The same measurement was used for the opposite end. After the two ends had hooks, one was placed the middle between the two (full shelf middle). The final two were placed in the middle of the end hook and the shelf middle. We did use shorter screws, for the hooks, as the ones included in the package were too long. Thanks for joining us today. We hope you are able to create your own DIY Wood Shutter Shelf. If you would like to stay up to date with our salvage posts, we invite you to sign up for our newsletter. Any free printables and extras are only offered to our subscribers. What an awesome project! I have lots of shutters waiting to be made into something and will have to give this a try! Thank you for the inspiration! Sam, I am a huge shutter fan so it’s always fun to find a new project. Hope you get a chance to do one. Great job! I was wondering where your blog hop badge is? And link for that? I’d like to add to my blog. Thanks! 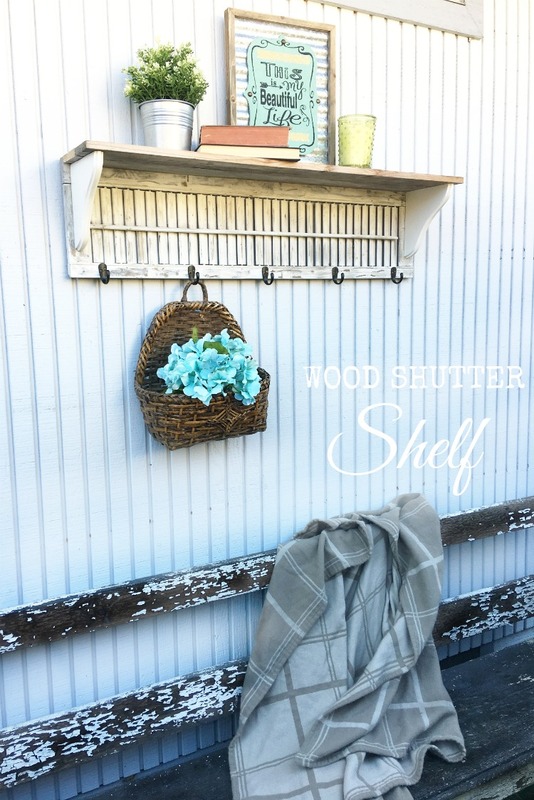 I definitely see shutters at the thrift store often and next time I am going to snag one and make this shelf. So darn cute. What a great project! 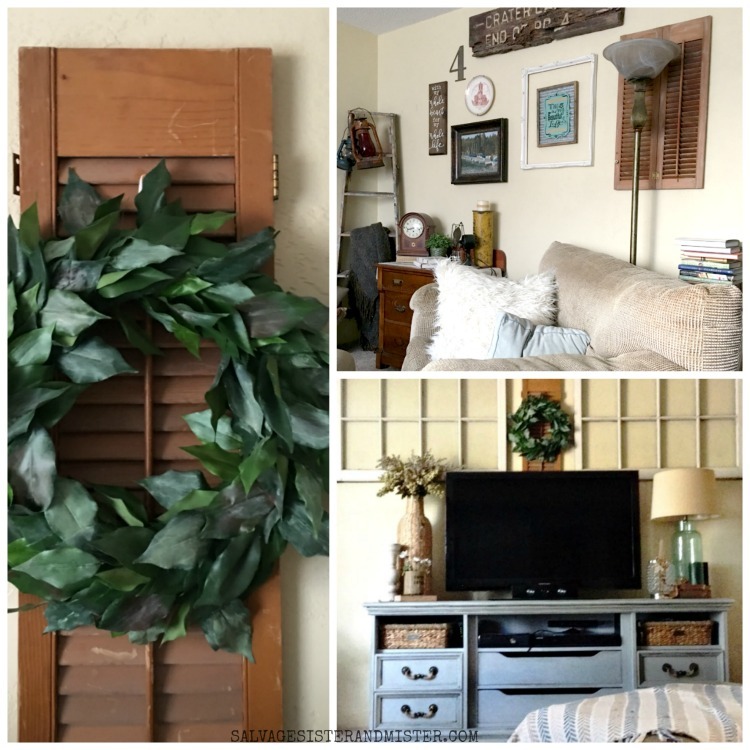 I will now think twice about those shutters I see at the thrift shops! Janine, Thank you so much my friend!!!!! Darn it, shutters are as scarce as hen’s teeth here in South Africa. I’ve even considered trying to make one from scratch . Love your shutter shelf Deborah, it’s beautiful. I wondered if you had tried to make one. It would think it would be difficult to make. So sad they are difficult for you to find there. 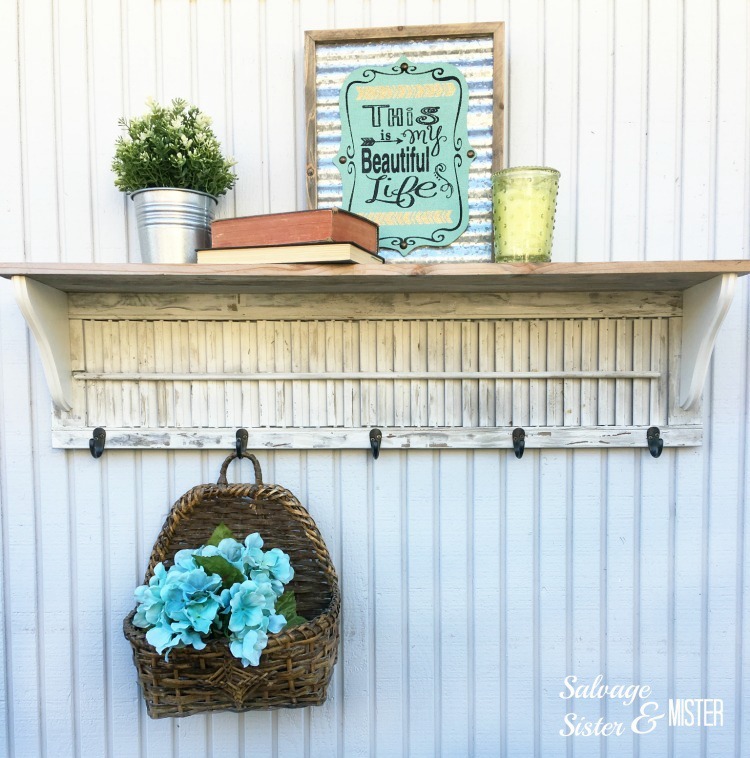 It is really beautiful… I’ve thrown away a lot of shutters because I’ve never thought about using them for such a creative and good looking shelf. Thank you so much. I hope you find some shutters and can make one or something else fabulous. Love what you did with the shutter! Wood shutters are hard to come by, but I was lucky to find some at an estate sale once.